“Another one of our raving fans,” explains Dan Cathy, Chick-fil-A president and chief operating office, the ringleader of a marketing phenomenon and cult-like following of chicken sandwich disciples like John, urban campers who follow restaurant grand openings with Deadhead dedication. “It is like a Grateful Dead concert. We have our own groupies,” says Cathy, who makes it a point to attend as many parking lot campouts as possible, mingling with loyal customers intent on scoring free food as part of the company’s “First 100 Grand Opening” promotion, in which the first 100 registered participants in line win one free meal per week for a year. These grand openings are local events, fast-food Woodstocks with impromptu jam sessions, DJs, movies, free ice cream, the familiar Chick-fil-A “Eat Mor Chikin” cows – a sense of community that migrates from parking lot to parking lot as the restaurant continues its seemingly inexorable momentum of growth, stretching out from its 72-acre woody, park-like south Atlanta corporate headquarters to win die-hard fans in every corner of the country. The restaurant chain that Dan Cathy’s father, S. Truett Cathy, founded 40 years ago in Atlanta’s Greenbriar Mall, now has more than 1,300 locations in 38 states and Washington, DC. It recorded annual sales of almost $2.3 billion in 2006, the 39th consecutive year the chain has experienced a system-wide boost in sales, which have more than doubled in the past seven years. Once seen only in shopping malls, Chick-fil-A has been building freestanding restaurants for 20 years, opening 63 of them last year and expecting to debut 71 this year, which means more lonely nights for Mrs. Cathy. “Last year I slept more often with customers than I did with my own wife,” jokes Dan Cathy, who has been known to wake his fellow campers with early-morning trumpet blasts of Reveille. A University of Texas computer engineering student, John Boiles – not the same John who phones in “moos” to the home office – launched The Chicken Pack last year. He started a website (chickenpack.com) to organize rides for his financially-challenged matriculant brethren in the Greater Austin vicinity. Boiles and other raving fans begin lining up 24 hours before a grand opening (typically a Thursday morning). Some arrive days in advance, then party all night long, a sub-culture celebration that crosses social boundaries. That’s a complex $2 billion question, and the company has spent millions trying to find the answer – evaluating its service, identifying core focus factors, such as taste, speed, attentiveness, courtesy and cleanliness. Cathy is addicted to service, and it pays off year after year with customer satisfaction awards and double-digit sales increases. It’s a company whose founder is guided by Biblical principles, with the secrets of its success probably rooted within the pages of another classic motivational book, Think and Grow Rich, written by Napoleon Hill and published in 1937. And he pretty much has. Cathy, who started his business career at the age of 8, when he sold bottles of Coca-Cola to his neighbors for a nickel apiece, has lived a Horatio Alger existence and built a beloved national brand. The nation has embraced a restaurant chain that uses renegade dairy cows to sell millions of chicken sandwiches. Long before he became synonymous with chicken sandwiches, Truett Cathy was famous for hamburgers. He ground the meat himself at his Dwarf Grill restaurant in Hapeville. Truett and younger brother Ben scrounged together $10,600, bought a small piece of land near the new Ford assembly plant and built their little diner, framing it and later equipping it with used materials. They opened in May 1946 and made $58.20 in first-day sales. Chicken was not on the menu. “I knew that I wanted to own my business, but wasn’t sure what it would be. Someone asked me what motivated me to get into the restaurant business, and I told him I was looking for somewhere where I could make a lot of money and do a little bit of work,” Truett Cathy says. “Turned out the restaurant business was the exact opposite – a lot of hard work to make a little bit of money. Cathy had to overcome personal tragedies early in his career. Ben and another brother, Horace, died in a plane crash in 1949, leaving Truett to run the business alone, with the help of his new bride, Jeannette. Together they operated the busy restaurant, now called the Dwarf House. Between 1953 and 1955, the couple had three children – Dan, Don (Bubba) and Trudy. At its core, even with 45,000 employees in hundreds of franchises nationwide, Chick-fil-A is a family business. Trudy, the youngest of the Cathy siblings, and her husband, John White, both work for the company’s philanthropic WinShape Foundation, which supports, among other things, a college program, boys and girls camps, foster homes and marriage retreats. This includes a co-op program with Berry College in which students can receive a full ride for four years. WinShape has awarded more than 700 of these scholarships since its inception in 1984. The Cathys wear their faith on their sleeves and take those Biblical principles seriously. Their “Closed Sunday” policy has become an unintentional marketing tool, appealing to both store operators, who need a break, and a clientele that appreciates the devotional gesture. The Cathys use the phrase “people before profits,” like a mantra, and it is infused in the way they treat customers and personnel alike. You’re much more likely to hear, “my pleasure,” in response from the smiling person behind the Chick-fil-A counter than “have a good one.” It’s part of the corporate makeup, almost genetically inserted into the operator mindset. And that’s another thing, the company likes to refer to its franchisees as “operators.” It implies a whole different fast-food mindset. 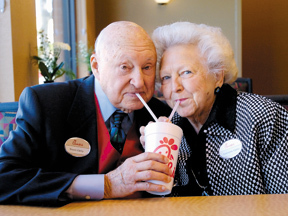 The company’s operator agreement, a Truett Cathy invention, is unique in the industry. Store operators can sub-lease a restaurant with a one-time $5,000 commitment, for which they receive a fully-stocked restaurant, a trademark, extensive training and advertising assistance, a guaranteed salary of $30,000 a year, plus half the net profits after 15 percent of gross sales goes to Chick-fil-A, Inc. The program is working: Chick-fil-A’s operator retention rate is 97 percent. “One of the most critical aspects of Chick-fil-A’s success has been the operator agreement,” says Jimmy Collins, who retired as the company’s president in 2001 after almost 35 years with Cathy. He helped build the first Chick-fil-A restaurant in Greenbriar Mall in 1967. Dan Cathy likes to say that it’s easier to get a job with the CIA than it is to become a Chick-fil-A operator. Meanwhile, his father boasts that 200 of Chick-fil-A’s employees at corporate headquarters have been with the company 20 years or more. Employees have access to a daycare center, a large weight room, workout center and racquetball court, and a cafeteria where the lunch is free and they don’t serve chicken every day. Actually, it took Truett Cathy a few years of flipping burgers before he discovered golden poultry. In 1961 he accepted a shipment of chicken breasts from airline vendors who had more than they could use. He remembered how his mother pressure-cooked chicken at the boarding house she ran during the Depression. Then he acquired a Henny Penny commercial pressure cooker that used oil and could cook a boneless chicken breast in four minutes. He experimented with different seasonings and breading, put the breast on a toasted bun with a couple of pickle slices and let his customers decide. In 1963 the Chick-fil-A name was registered. At first, Cathy sold his product at the Dwarf House, and to other restaurants. In 1967 he opened the first Chick-fil-A restaurant in what was, essentially, a 384-square-foot cubbyhole in Greenbriar Mall. Forty years and 1,300 store openings later, Chick-fil-A is the second largest quick-service chicken restaurant chain in the country – KFC is still number one. Matter of fact, the Cathys thought kindly enough of Colonel Harland Sanders’ recipe that it wasn’t unusual for Truett to bring a bucket of chicken home for Sunday dinner, a little-known fact that Bubba shares. “Dad used to say, ‘I guess I’m not so smart. Colonel Sanders is making a bigger fortune selling chicken bones than I am with boneless chicken breasts,’” Bubba says. Nonetheless, the Chick-fil-A brand, previously known only to mall shoppers in the South, has a soaring national potential and recognition. College football fans are familiar with the Chick-fil-A Bowl (formerly the Peach Bowl – Chick-fil-A paid $22 million to change the name). Based in Atlanta, the game pits ACC and SEC teams against each other. This year’s game saw a record attendance of 75,406 (exceeded only by the Rose Bowl and Sugar Bowl), and led all bowls in charitable giving. But the company’s greatest marketing scheme, the stuff of advertising legend, is the “Eat Mor Chikin” cows, who have been trying to protect their own hides since the campaign debuted in 1995. The fact that these symbols, with their “Far Side” sensibility, resemble Holsteins – dairy cows – does not matter to the millions of people who buy cow calendars every year. “It’s renegade self preservation. The fact that cows would go to such great lengths to save themselves is so endearing to people,” says Ron Henderson, a Creative Group Head who works on the cow campaign for The Richards Group, the Dallas firm that created the campaign for Chick-fil-A. Steve Robinson, Chick-fil-A senior VP and chief marketing officer, says the company got serious about advertising when it started opening freestanding restaurants in 1986. “In the mall environment, we discouraged advertising – we didn’t need a lot of it. The mall is a captive environment. Later, during a creative session with the Chick-fil-A marketing team, Richards displayed a number of possible new concepts. Since the campaign started 12 years ago, cow iconography has played well in restaurants, in print, on radio and TV, and last year the cows were inducted into the Outdoor Advertising Association of America Hall of Fame. And system-wide sales have tripled. Now that its clever cows have built brand awareness nationwide, what’s next for Chick-fil-A? As the company, steadfastly private, reviews its 10-year-plan, Dan Cathy sees real potential in uncharted territory, such as Portland, Seattle, Detroit, Chicago and New York. The company has been aggressive on the West Coast. Dan’s and Bubba’s oldest sons, Andrew and Mark – a third generation of family leadership – are in California to pioneer that growth. With an eye toward the future, Dan warns that a family name doesn’t by itself make a good leader. But it doesn’t hurt.